Edinson Cavani to join Arsenal this summer Fichajes.net have revealed that Paris Saint-Germain striker Edinson Cavani will join Arsenal in the summer. 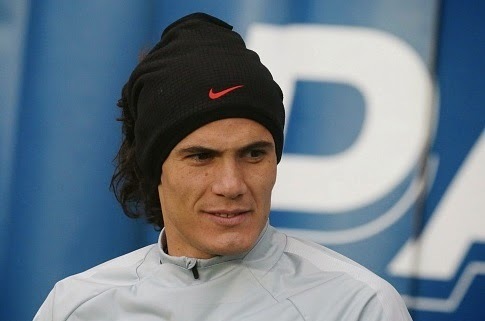 Fichajes.net have revealed that Paris Saint-Germain striker Edinson Cavani will join Arsenal in the summer. Edinson Cavani has been heavily linked with a move away from France in the winter window which ended earlier this month. The Uruguay international is not happy in Ligue One with PSG as he is not getting his favourite central role due to the presence of talisman Zlatan Ibrahimovic. He has been playing on the left attacking role which has not given him much chance to impress. His agent has already revealed that he is likely to leave PSG in the coming summer with PSG also considering to offload him along with Ezequiel Lavezzi. The French giants are planning to offload the duo South Americans for a combined fee of 80 million pounds. However, Cavani would cost around 60 million pounds. Manchester United and Arsenal both have been linked with the Uruguayan and recent reports claim that he will prefer Arsenal. It was reported earlier this year that the Red Devils would sign him inplace of Radamel Falcao who has failed to impress at Old Trafford. But Arsenal will be his next destination as he arrived in London recently for his possible summer move. The 28-year-old has scored 40 goals in 71 appearances for PSG since his move from Napoli in 2013.